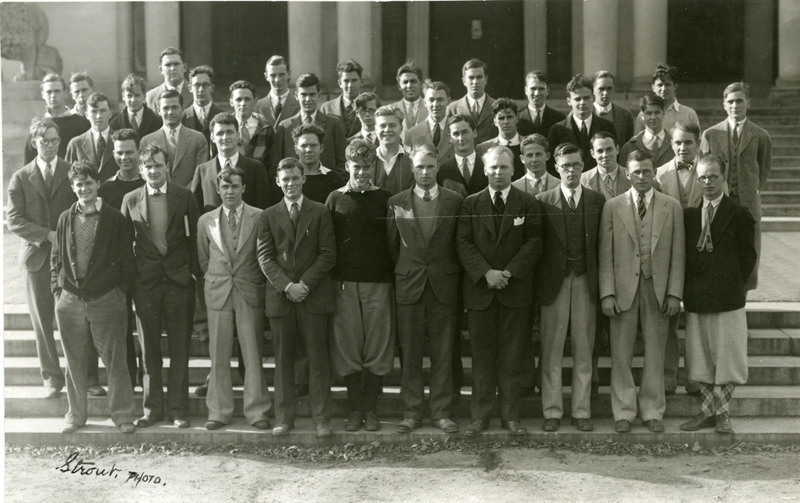 Group portrait of students who are sons of alums. Left to right, front row: Woods, Leighton, Cushman, Dane, Whitcomb, French, W.R. Thomas, D. Swan, A. Spear, E. Spear. Second row: Cousans, Means, Snow, J.P. Smith, Garceion, Bates, Perkins, Boothby, Ward, Soule. Third row: Donworth, Sears, Petting II, E. Dana, R. Dana, Dyson, Bell, Shute, Mallett, E. Thomas. Fourth row: Foster, Fisher, Johnson, Brown, Drake, Mullin, Clark, Riley, Chapman, Fuller, Perkins, M. Swan. McKown, Abbott.